Alicia's Advice for Speaking Success: Good intentions are great … but only if you act on them! 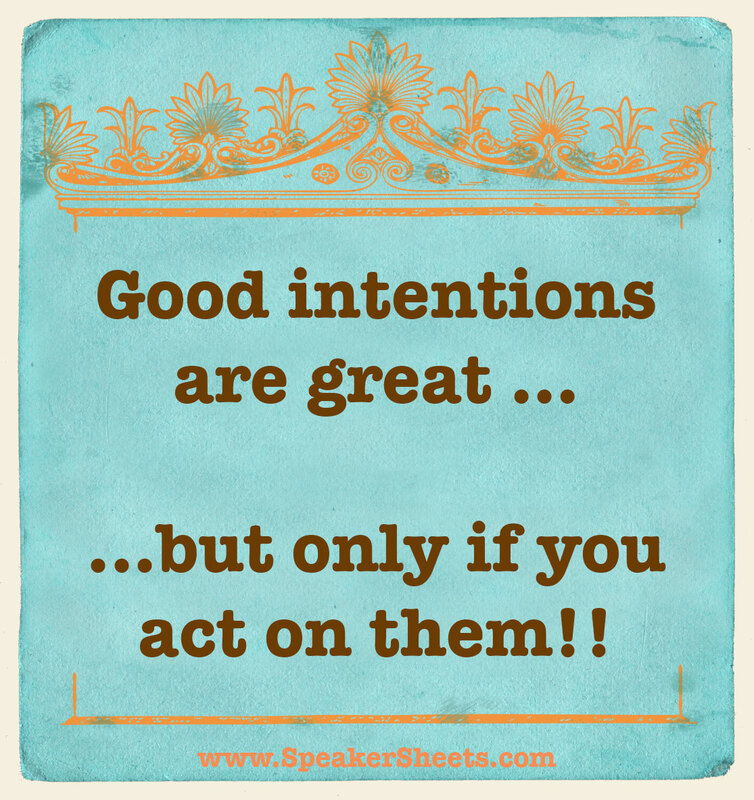 Good intentions are great … but only if you act on them! I must admit, for about 2 years now I have had good intentions to start my email marketing campaign in which I would send a useful speaking tip to help with Your Speaking Success. Yep! Two years! It seems I never had enough time to implement this process. So, why did it take me two years to “find time” to finally pull this together? It’s not like an extra hour suddenly popped up in my day. The change to set forth my good intentions came through prioritizing. Before the new year, I sat down and listed my priorities. In both my personal life and business, I came to the conclusion that “I” was the number one priority. Duh, right?! It seems I’m what you call a “People Pleaser.” People Pleasers often neglect their own self to serve others, and with pleasure, I might add! Prioritizing helped me to realize that if I don’t follow through with my good intentions, then I can’t help my clients – the very reason why I’m in business! After setting my priorities and a schedule, I finally sent my first email to my followers and fans. Whew! What a relief to finally do it. On top of the relief came great joy. I received numerous responses from clients, business partners, and friends wishing me well and a job well done! That was icing on the cake. No matter the time of year, take time to write out your good intentions for your business practices, for public speaking, or for your personal life. Remember, good intentions are great … but only if you act on them! Would you like to receive these valuable tips to build Your Speaking Success? Tips cover every aspect of speaking: from stage presence and back of the room marketing to devices for speaking and presentation dos and donts. Whether you use speaking as a marketing tool for your product or services, to gain more clients or build a successful speaking career, these tips will help you. Simply sign up at www.SpeakerSheets.com and receive a FREE Speaker Sheet Top 5 Must Haves Checklist. Sign up for valuable email tips on public speaking!